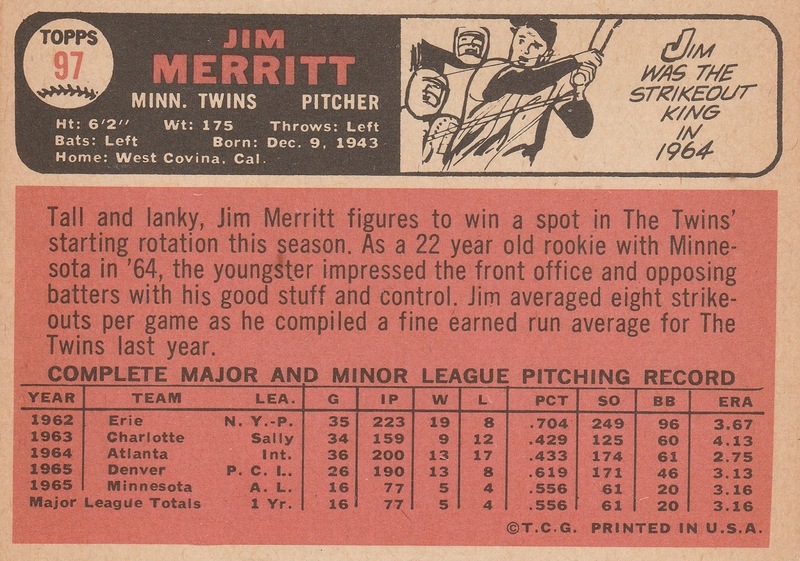 Jim Merritt pitched for 11 seasons – 4 with the Twins, 4 with the Reds, and (I didn’t know this until today) 3 with the Rangers. I always think of him as a Twin because that’s where he was when I started collecting cards, but he had his greatest success with the Reds. Merritt was signed by the Dodgers (the 2nd thing I learned about him today!) in 1961. He went 19-8 for the Dodgers’ class-D team in Erie, PA, but apparently that wasn’t enough to protect him from the minor-league draft. 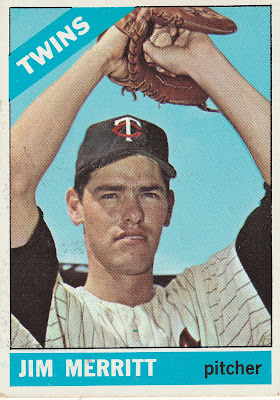 He was selected by the Twins after the ’61 season. Jim spent the next 3 seasons in the Twins’ farm system, making his major-league debut in August 1965. He made 2 relief appearances in the ’65 World Series vs. the Dodgers. 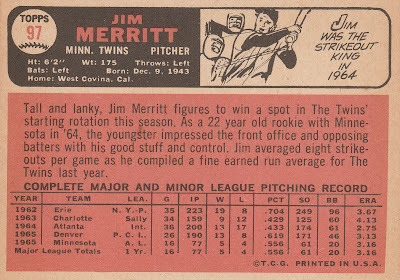 Merritt was a key member of the Twins’ starting rotation from 1966-68, and was one of 6 pitchers named Jim on their staff in ’66 and ’67. In November 1968, he was traded to the Reds for shortstop Chico Cardenas. Jim won a career-high (at the time) 17 games in 1969, and topped it the following season with 20 wins. He also made his only All-Star team in 1970, and finished 4th in the NL Cy Young voting. That year he also pitched 2 games in the post-season. 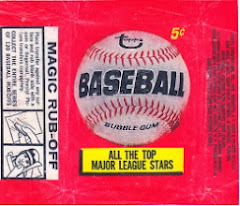 As seems to be the custom with Reds’ pitchers in those days (Gary Nolan, Wayne Simpson, Wayne Granger, Jim Maloney, Sammy Ellis, etc, etc.) 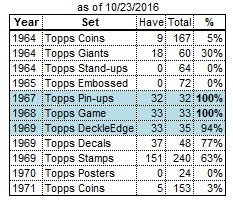 Merritt came down with arm troubles (in his case, an elbow injury), and compiled a horrendous 1-11 record in 1971. He was moved to the bullpen after an 0-8 start, and won his lone game in August. 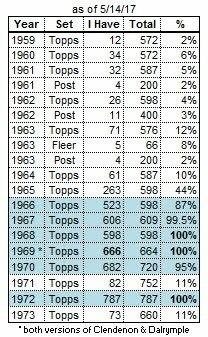 Jim followed that up with a 1-0 record in only 4 games in 1972, while spending most of that season with AAA Indianapolis. After the 1972 season he was traded to the Rangers for backup catcher Hal King. Merritt pitched 2 full seasons with Texas (5-13 in 35 games in ’73, 0-0 in 26 games in ’74) and was released in July 1975 after only 5 appearances.